Update: U.S. Airbase Cancelled? Sea Mammal Saved? Hello again from Japan. As I continue meeting with members of the peace, justice, and environment movements here, new opportunities for trans-Pacific cooperation among activists are developing almost every day. 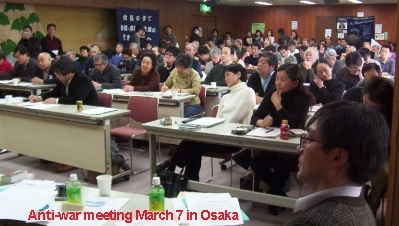 Japanese and U.S. activists share many of the same concerns. For example, one of my friends here works with the homeless in Osaka city, and has been to the Palestinian territories. Opposition to the occupation of Iraq is strong, and activists here face civil-liberties threats that parallel the USA PATRIOT Act. If you have not already done so, please send our second letter regarding the Caterpillar tractor company, part of a campaign spearheaded by Jewish Voice for Peace (JVP). This new letter goes to 49 dealers of Caterpillar tractors and bulldozers. On April 14, at the Caterpillar annual meeting, shareholders will vote on a resolution calling for an investigation of how Caterpillar equipment is being used by the Israeli military for human-rights violations against Palestinians. (The vast majority of demolitions -- thousands of homes, and hundreds of thousands of olive trees -- have nothing to do with terrorism, the Israeli army acknowledges.) Our letter urges Caterpillar dealers to support the April 14 vote. 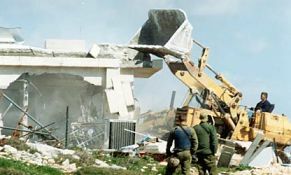 If you are on JVP's list, you received an alert about this campaign on March 16, a year after U.S. peace activist Rachel Corrie was killed by a Caterpillar bulldozer. Now, we are asking ProgressivePortal.org's other users to join in. If you haven't already done so, please send the letter now. This new campaign is aimed at Caterpillar dealers; our previous Caterpillar letter went to company board members. If you haven't already sent that letter, you are welcome to now. For several months, ProgressivePortal.org users have been writing letters to U.S. and Japanese officials calling for preserving a highly endangered sea mammal, the dugong, revered by the Japanese as a symbol of peace. Ironically, the Japanese dugong's survival is threatened by plans to build an offshore U.S.-Japanese airbase in the middle of critical habitat. There have been positive developments recently, but critical decisions will be made very soon, so we must step up the pressure now. A gentle, shy creature that feeds on sea-grass beds, the dugong is threatened throughout the southern Pacific, but the Japanese subspecies is in a particularly precarious state, with new estimates placing that population at a mere 20-30 animals. I recently visited the site of the proposed base. It would block access to or destroy major feeding-grounds and habitat for the dugong, a close cousin to the manatee. 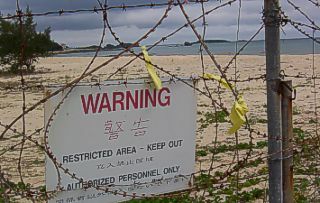 The giant airbase would also destroy spectacular views along the western shore of Okinawa island. Recently, U.S. Defense Secretary Donald Rumsfeld indicated that the U.S. may abandon the project. But the Japanese government indicates it might push ahead even without U.S. participation; and the Bush Administration's developing new military strategy may affect the proposal. If you haven't already done so, send a letter urging protection for the dugong and cancellation of the airbase plan. Send a quick note to up to 10 friends urging them to participate. Already, more than 75,000 save-the-dugong messages have been sent; we need to make that 100,000 in the days ahead. Domo arigato gozaimasu -- thank you very much. And a special thank-you to ProgressivePortal.org volunteers Nora, Betsy, Gerri, and Billye for their help with this campaign. My visit to Japan (March 5-April 5) has included sharing dinner with a group of homeless men living in Osaka city's Nagai Park; attending a court hearing in which 30 local citizens are suing the school system over punishment of teachers who refuse to participate in nationalistic ceremonies; learning about arrests of peace and homeless-rights activists for trivial infractions, and the problems they face in a society with minimal public-interest legal support; seeing the growing sophistication and impact of the anti-war movement; and learning about a growing movement to democratize local governments, spurred in part by a documentary about Berkeley, California. I also met with ProgressivePortal.org users in Osaka. There has been no time yet to write about all this; I will share photos and information, including the text of my speech about how we can expand the peace movement, later this month. Increasingly, viruses infecting our users' computers are distributing themselves disguised as messages from ProgressivePortal.org. This is causing a certain amount of havoc for us. If your computer becomes infected, the virus searches your e-mail for addresses. It sends itself to some or all of those addresses, attached to a message with a fake "From" line containing one of those other addresses. If you have received mail from us and your computer is infected, it may send out virus-laden messages that are falsely designed to look like they came from us. We are getting more and more error messages and complaints as a result. If you get a message that looks like it came from us and contains an attached file you aren't expecting, DO NOT open or click on that file. The message probably did NOT come from us, and the attachment probably contains a virus that will activate when you open it. Instead, delete the message and its attached file. Unfortunately, with so many pathological people writing Internet viruses, good "Netiquette" requires all users to have virus-protection software and keep it updated by downloading the new virus "definitions" several times a week. We encourage you to adopt this practice so your computer does not unwittingly harm others, including us. 5. Thanks for Your Support! I want to thank all who have contributed to our work, whether by volunteering, donating money on a one-time basis, pledging a monthly contribution, spreading the word about us, or purchasing our peace, justice, and environment merchandise. We aren't yet at the break-even point, so if you would like to consider supporting us in one of these ways now, we would be grateful for your help. Once again, I am grateful for all your efforts to foster justice, peace, freedom, and environmental health in these challenging times, and honored to participate with you in the quest. Please send a letter to 49 Caterpillar dealers (with one click) expressing concern about their equipment's use against Palestinians. Help keep ProgressivePortal.org going with a contribution or a purchase -- take a look at our striking new posters (and much more).